The Children's Choir and Older Children's Ensemble of First Baptist Church, Woodbury, presented their Spring Musical, 'Step Right Up', on Sunday, May 19, 2013. 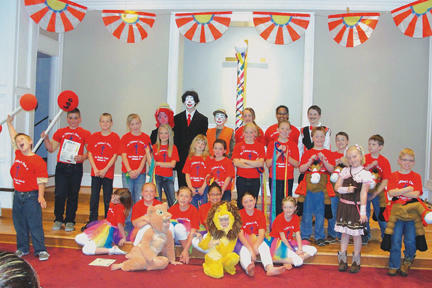 The circus themed music offered encouragement in overcoming fear and life's challenges through faith in Jesus Christ. Pictured Left to Right, Seated- Ellie Danielson, Addison Melton, Katie Hare, Bradi Mason, Jailyn Elgin, Graham Edens, Emma Richardson, Emma Edens; Standing (first row) - Kooper Nemeth, Brady Bryson, Noah Lacerte, Katie Waggoner, Haylee Ekland, Sydnee Ekland, Ansley Holt, Hannah Sullivan, Autumn Barrett, Elijah Danielson, Cathan Cecil, Emma Haley, Robert Bucher, Ethan Hargrove; Back Row - Dalton Taylor, Weston Hargrove, Branden Schwartz, Isabel Haley, Etta Gaines, Drew Bucher. The Summer Session of Children's Choir will start with practice on Wednesday evening, June 12, 2013. We welcome everyone who will be entering grades 1-6 in the fall.